Snap up. Snap down. Sherpa fleece-lined earflaps with antiqued brass buttons, a classic depot look with winter functionality. 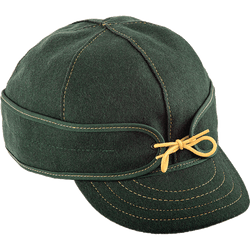 If you're building a Stormy Kromer® collection, or otherwise looking for an ultra-soft winter hat, give this unique cap space on the shelf. Great hat but please make on in orange for hunting! Thank you! The cap fits perfectly, the ear flaps are perfect. Wouldn't recommend it. I would think northern Michigan would be peddling a warmer hat. Need more or different sizing, like the SK Original has. Medium that I got is kind of tight and the next size is a Large which is to loose and would not stay on. Sizing is poor on these caps especially for the high price. This hat is perfect for cold windy days, it fits snug so that no drafts get in, but breathes well enough that it doesn't get sweaty. Love this hat, and I'm looking forward to my next Stormy for the collection. 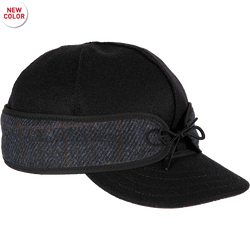 The Bergland is a nice warm winter cap made of quality materials by American workers. Looks good with ear flaps up and keeps my ears warm when folded down also keeps the back of my neck warm. On very cold days with high winds my ears do get somewhat cool I found that by wearing a thin Balaclava under the hat my ears stay warm. Thank you Stormykromer for a quality hat. My nephew loved his hat and the flaps too. Fits perfectly. Nice and warm! I have been wearing a Stormy Original cap now for several years and while it is a perfectly good cap I needed just a little more protection around the ears while out in the cold and wind at work. This cap fit the bill. I have worn it for the last couple of weeks and have been impressed with how much warmer it feels over the Original and the ear flaps are worth every penny. With the exception of my Rancher's Cap which I use only for hunting, this is by far the warmest cap I own. It runs a little big on my head since it's not size fitted beyond S,M,L,XL but not so much that it would blow off my head. A great addition to my expanding collection and being US made is the best part. 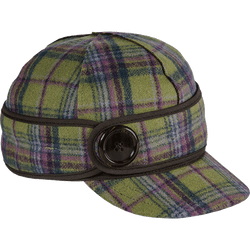 My Bergland cap is in olive, and the color strikes me as being a tad darker and subdued than the photos online, but in a welcome way. Mine is a large, and the fit is perfect as my ideal size is between 7 3/8 and 7 1/2. The materials are soft and comfy, and although it hasn't been truly cold yet this winter, it feels that it will be warm enough. Construction appears top notch. Overall the appearance of the hat seems to cast a flatter profile than the pictures, but the silhouette is distinctive and classic. The ear flaps unsnap and secure easily enough, and the interior surfaces of the snaps don't bother me at all. One drawback is that when the flaps are down and the wind head on, cold air will get to the ears. Admittedly, this is something I could tell by the photos as there is no chin strap to link the ear flaps as with some of my military surplus winter hats. Even so, this hat wasn't purchased with the intent for protracted cold weather exposure, but rather for errands involving a lot of in-and-out of vehicles such as when running around checking fields and equipment sheds and picking up and delivering materials.